Old Charleston Civil War and Slavery Walking Tour is no longer available. The Old Charleston Civil War and Slavery Walking Tour answers questions about the richest and most controversial veins in Charleston's history as you journey back in time to a very different city on a narrated walk that covers the most interesting historical issues and sights in a place known for it's turbulent past and unusual beauty. Battery Park in Charleston, South Carolina is a landmark defensive seawall and promenade in Charleston, South Carolina. Named for a civil-war coastal defense artillery battery at the site, it stretches along the lower shores of the Charleston peninsula. Fort Sumter is visible from the Cooper River side (High Battery) and from the point, as are Castle Pinckney, the World War II aircraft carrier USS Yorktown (CV-10), Fort Moultrie, and Sullivan's Island. Washington Square, located at the corner of Broad and Meeting streets, is one of the Charleston's debut parks. 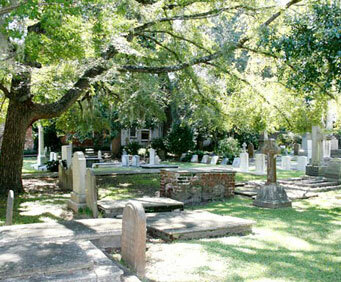 The park, with its mature canopy of live oaks, is the perfect place to sit and enjoy a quiet moment. The shade is a welcome relief to visitors and locals alike who want to take a break from the summer heat and humidity. The Calhoun Mansion is a Victorian house built for George W&period; Williams. The 24,000 square foot house has thirty main rooms, complete with a 50 foot long main hall and ballroom with a 45 foot high ceiling. Williams' son-in-law Patrick Calhoun inherited the house upon Williams' death and in the 1930s the mansion was turned into a guest house. Institute Hall, built in 1854, stood until 1861. An Italianate building, it was designed by Jones and Lee for the South Carolina Institute, a progressive organization promoting "art, ingenuity, mechanical skill, and industry." It hosted the 1860 Democratic convention, which split over the mention of slavery in the party platform. The Mills House Hotel has one of the most interesting histories for a hotel establishment in downtown Charleston. The hotel survived the Civil War and on separate occasions, in the late 1800's survived fire, hurricane and earthquake as well. In 1901, Theodore Roosevelt stayed in the hotel and occupied the same room as that of Robert E. Lee. The Mills House management and staff take obvious pride in paying scrupulous attention to providing personal attention and authentic luxury accommodations for their guests. 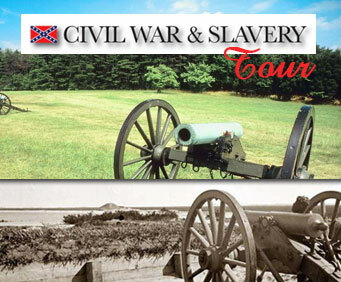 Throughout the tour, your professional tour guide and history expert will share with you some fascinating stories about the Civil War era. You will learn more about how the Civil War influenced the city and national history. You will love exploring more about the history of Charleston during the Civil War era from a commercial, political, and private standpoint. The Old Charleston Civil War and Slavery Walking Tour is the ideal way for history buffs as well as those with even a mild curiosity in the city's history to enjoy a fascinating and insightful look back in time. 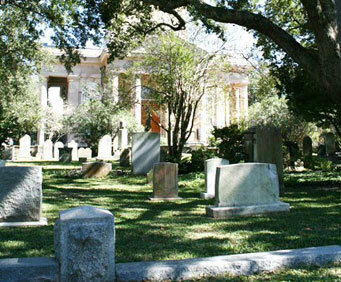 Reserve your space on the Old Charleston Civil War and Slavery Walking Tour today! Not recommended for older out of shape persons as it is a lot of walking! Noted several people in my group quit before the walk was over. The guide knew the history of charleston & enjoyed sharing his knowledge & experiences with the group...It was great!